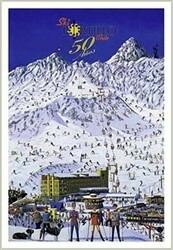 This great Ski Portillo Chile Poster commemorated the 50th Anniversary of Skiing in Portillo Chile. 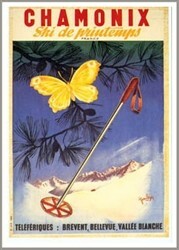 In July of 1949 the Portillo Ski Resort was inaugurated under the supervision of the government hotel company HONSA. In 1961, the Portillo ski area was sold to private investors. The principal stockholder was Robert W. Purcell, a New York investment executive who initiated a development plan for the ski area which included new ski lifts and construction to increase the hotel capacity to 500 beds. The hotel was refurbished and a heated swimming pool and sauna facilities were added. These improvements enabled Portillo to bid successfully on hosting the World Alpine Ski Championship in 1966, an international event which marked the beginning of modern skiing in South America. 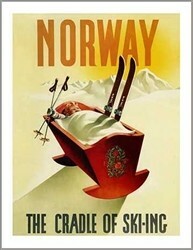 European and North American skiers discovered that great skiing could be enjoyed during the summer months–and that South America had well-developed facilities and exemplary skiing. By 1968, the international road between Chile and Argentina was finished, allowing easy access to Portillo via automobile. If you want to ski all year or train in the summer, Portillo is one of the top spots in the world to get your fix. Notice the famous Gran Hotel in the background. 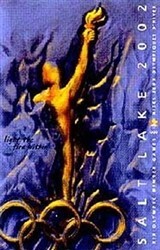 What looks like small figures are actually skiers in every possible move often seen on the ski slopes. Therefore the poster is also quite funny.